I’ve been excited about Octopath Traveler for a while. The team behind it amped up the anticipation for RPG fans by framing it as the spiritual successor to the well-regarded Final Fantasy VI, and while the comparison makes sense in places (ensemble cast, medieval trappings, random battles, cute pixel characters), after 60 hours, the game doesn’t have a killer big bad, and I’ve seen none of the slick set-pieces (Middle-of-the game opera? A team battle with Moogles? Fight a runaway train?) that made FFVI such a hit over 20 years ago. Octopath Traveler‘s strength lies in its battle system. Stylistically it reminds me a lot of Golden Sun (vintage 2001), with HD-2D areas and turn-based battles filled with pyrotechnics. For others, it’ll feel like the SaGa series. There’s a boost system familiar to anyone who’s played Bravely Default, which adds an extra tactical dimension to battles — I told you the game pulled inspiration from a lot of places. Once boosted, attacks will light up the battleground, illuminating (and reminding you of) the 3D surroundings. For once, battle dynamics are easy to explain: They center on elemental and weapon weaknesses, and you’ll have to combine attacks from your four-person party to break enemies, stalling their movement and increasing the damage you deal to them. Tighten your strategy and perfect battles will be rewarded with extra experience points, skill points and sweet, sweet money. 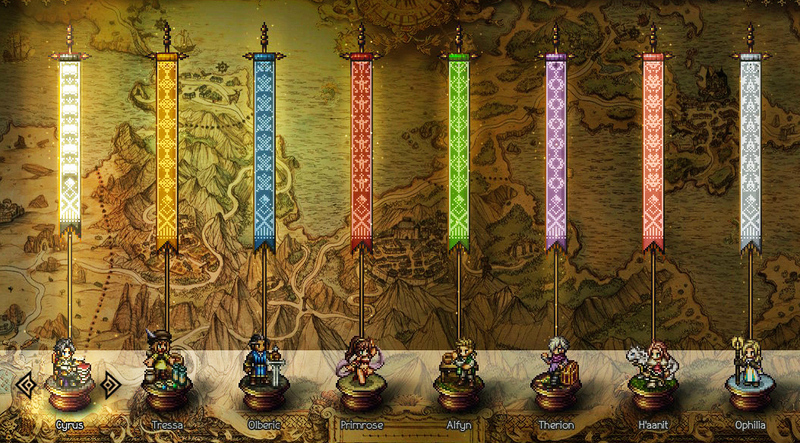 Each member of your team starts off with their own established class: Merchant Tressa, Warrior Olberic, the apothecary Alfyn, the dancer Primrose, Therion the thief, the cleric (white mage) Ophilia, the scholar (read: Black Mage) Cyrus, and the hunter / Pokemon master H’aanit. 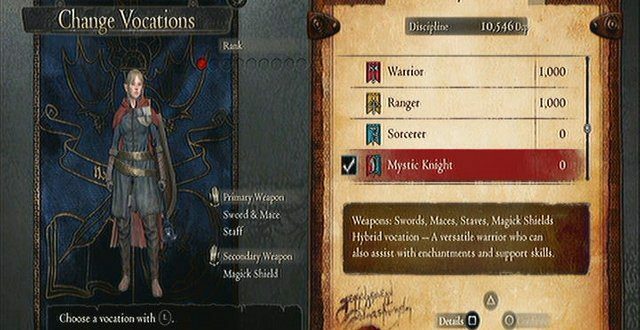 Loosely, classes can be organized into physical attack (warrior, hunter, thief), support (apothecary, dancer) and magic attack (scholar, cleric), but there’s some overlap. 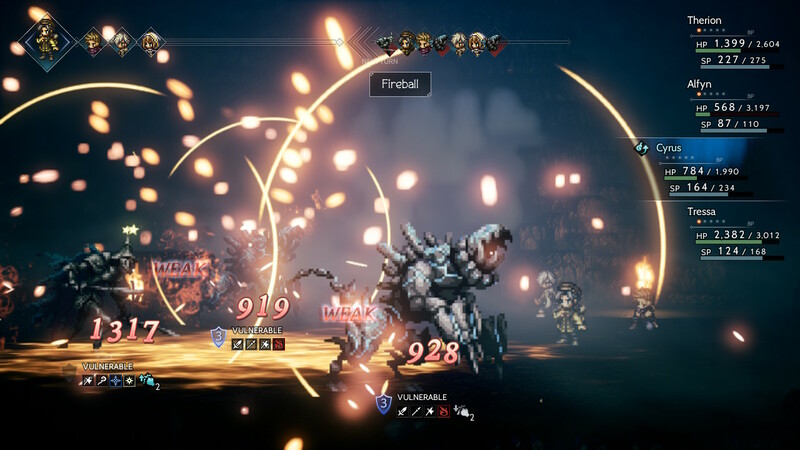 Therion, with his thief class, still has a single-target fire attack, while the apothecary Alfyn can deal physical damage, heal status effects and HP, and wield ice attacks and concoct random battle items on the fly. There’s a lot of freedom to create a party that suits your battle style. By the middle of the game, you’ll gain access to shrines that add secondary job classes to members, ensuring your team keeps well-balanced regardless of who’s in the starting line-up. Frustratingly, any character not in your party doesn’t gain experience, so team management between episodes is a necessary evil. Nearer the end of the game, there are even some secret class shrines (replete with challenging enemies) to unlock. I’ll leave them as a surprise. The retro look of Octopath Traveler will be divisive, and this might just be due to the lack of RPGs on the Switch — or the big-budget games we’re used to seeing on consoles. It seems less cloying while playing it in handheld mode, but on a 4K TV, regardless of glossy sun-dappled oceans and ominous forests, it still looks dated — even with the cute tilt-shift effect.